Our unique feel-good card is thicker and feels better in your guests hands than standard invitation card. 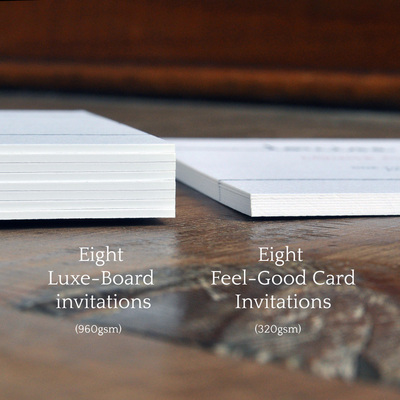 We believe invitations should feel as good as they look. 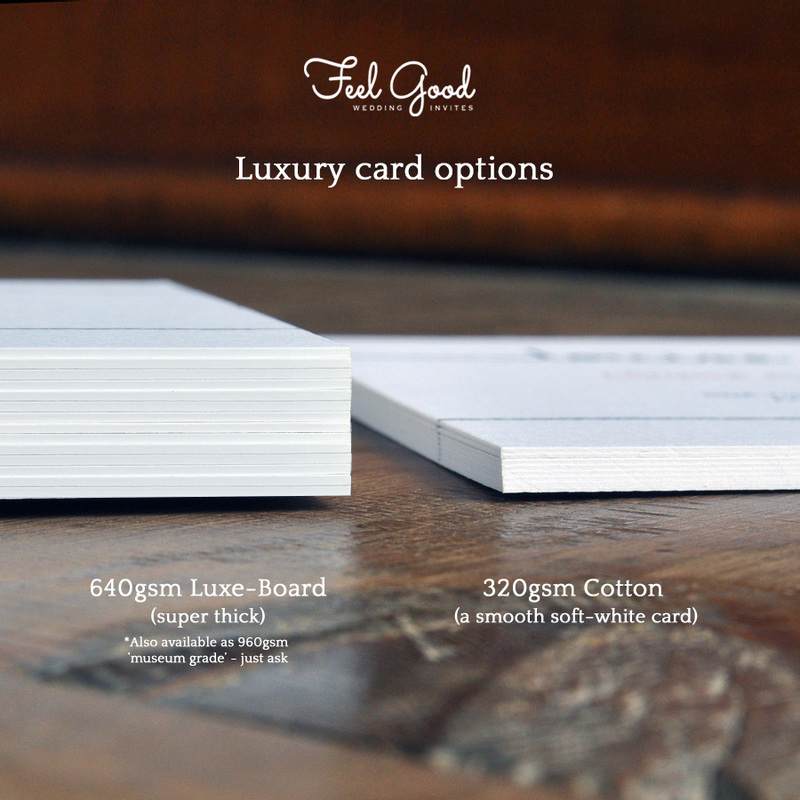 We have sourced our own luxury card from a small independent British paper mill. It's 320gsm weight along with its soft-white colour and subtle matt texture ensures that it oozes quality. Made from 75% wood pulp and 25% cotton, our card is a natural product which is kind to the environment. We also use Eco Kraft paper which is fibrous and variable with a rustic surface texture - perfect for outdoor and barn themed weddings. Our Eco paper is 280gsm and 100% recycled and recyclable. Wedding Save the Date magnets have the advantage of becoming a great keepsake of the occasion & are more likely to be left stuck on a guests fridge during the build-up to the big day to help them remember the date. Our high-quality gloss magnets are wipe clean and hardwearing and are fully customisable for size, shape, colour and layout. We believe its important how an invite feels, not just how it looks. The invite will often be the first taste of your wedding day for your guests. ​The thickest invitations money can buy! These luxury wove-cotton invites are double (640gsm) or even triple (960gsm) thick and are truly a joy to hold in your hand. The museum-grade board turns your invitations into real family keep-sakes for generations to come. Contact us for further details. Or order a sample from the store. Enjoy a friendly, personal experience working with your own designer. We will spend time to get things looking just right, help you with any wording queries you might have and advise you on colours that complement each other. Once we have discussed colours, words and ideas with you, we will sit down and work carefully on each of your lovely bits of stationery, checking in with you along the way to make sure you are 100% happy with the designs. We are so privileged to be involved in your most personal of days, we feel a responsibility to ensure we only offer the best invitations possible. As a result we take our designs very seriously and spend a lot of time looking for new trends, listening to our customers and perfecting our designs. You can be sure we are always offering the latest and most creative wedding invitations. Sarah has proof read so many invitation suites, this, coupled with her love of English Literature, ensures she is always able to help with any tricky wording or etiquette issues you might have. Please just ask & we will be happy to help.